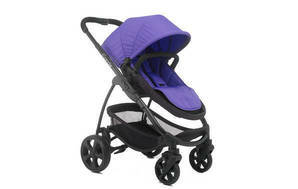 Snapshot: The iCandy Strawberry 2 is a single stroller that's suitable for a newborn baby. But how safe and easy to use is it? Suitable for a newborn baby (using the supplied bassinet). Has three seat recline positions. Failed three major safety tests: the crotch strap can be removed from the seat; with the seat reclined and canopy lowered, a child's head could get trapped; at their longest and shortest settings, the harness loops are a strangulation risk. Failed two minor safety tests.